In a Twilight Zone kind of moment, imagine an all-night grocery store. Few are there: a stocker, a maintenance worker, and a check out cashier. Three shoppers arrive at approximately the same time. Sleepily they shop for the few essential items on their list. Coincidentally, and unbeknownst to each other, they manage to add the same six items—down to the very brand and packaging—to their shopping carts: milk, cereal, hamburger, two loaves of bread, and pancake mix. They move to the checkout. The cashier is confused—there must be something wrong with the store computer! The shoppers are incensed! So just what is the FICO score? And how can one change it? First, why a “score”? “Credit scores are essentially your credit report’s grade”1. Have you noticed that when you apply for a loan, the decision is normally made in very short order? The last time I applied for an auto loan the auto finance office had the decision in a matter of minutes. The last time I applied for a credit card, the decision was made almost instantaneously. When someone applies for a loan, the lender does not pull your credit report and pour over every little detail. That would take a lot of time and would be very subjective. Instead leaders use a scoring system. While all the major credit bureaus have a scoring system, by far the Fair Isaac Company is the leading credit scoring company. The FICO Score is a number that summarizes your credit risk. Lenders use it to make credit decisions, such as the interest rate you get when you apply for a loan. One may model interest rates on various products at www.bankrate.com. Your Payment History—35%: Pay your bills on time and you’ll score very well in this category. Late payments, missed payments, charge-offs, collections, judgments, liens, foreclosures, short-sales, settlements and bankruptcies should be avoided if you want to score well in this category. How Much You Owe (debt)—30%: Paying your bills on time may be the largest factor in your credit score calculation, but how much debt you’re carrying comes in a very close second. Combined, these two categories make up 65% of your score. This category places a significant amount of emphasis on your revolving utilization—the proportion of your balances in relation to the credit limits on your credit cards. Carrying high credit card balances or maxing out your credit cards will hurt you here. Length of Credit History—15%: The longer you’ve had credit, the better. This category looks at the date each of your accounts were opened and calculates your length of credit history on an individual account-by-account basis, and also on an average total age across all of your accounts. New Credit (inquiries)—10%: The more inquiries you have in a short period of time, the higher the risk. To score well in this category, you’ll want to avoid applying excessively for new credit. There are a few caveats to this rule, depending on the types of credit you’re applying for—namely auto, student and mortgage loans. Pay your bills on time. Delinquent payments negatively impact one’s FICO score. Over the last three years my wife and I have endeavored to increase our FICO score. I’ve never seen this “trick” documented but this is what we did. We would pay the credit card balance off several days before the statement ending date. I reasoned, why wait for the statement. I know the statement closing date and I know how much I owe, so I will make a payment early. The result was that “how much I owe” factor which is 30% of the score was nearly zero. We were able to improve our FICO score by more than 50 points. 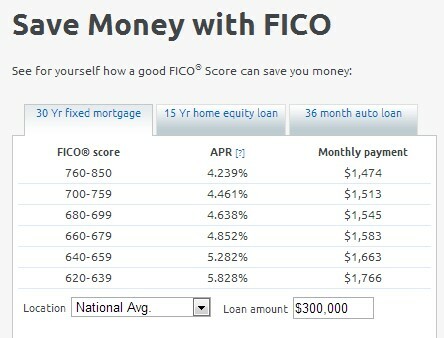 If one were never to borrow, the FICO score would be unimportant. But most of us use and will continue to use credit. Understanding and leveraging the FICO score will enable one to borrow at more reasonable rates. Back in 2012, I was out of work for most of the year, and when time came in 2013 for me to look for a new home, the bankers were impressed by the FICO score I'd maintained despite a bit of tough times. It really says a lot to them. The importance of the FICO score diminishes the more you use cash and the more savings that you have. For example, the more you put down on your house the more the FICO score doesn't matter. The more you consolidate your retirement accounts the easier it is to get credit with a very poor credit score. FICO score becomes increasingly more important the more that you rely on credit without the means to back it up. I know that some people will argue that a better FICO score gives you better rates, but that is not always true. In general it is true, but again, if you put down 50% cash on your house, the difference in rates on someone with a 650 score and an 850 score is negligible to non-existent. If you have your retirement accounts at a bank (say Chase), you can get the top preferred rates as someone with less in deposits, but with a better credit score. The more I have used the cash and consolidated things, the more I have seen my credit score become irrelevant. The importance of the FICO score diminishes the more you use cash and the more savings that you have. t.
Often times the better one's credit score .. the less significant it is. Cash is great if you have it but many young people and older ones like me spent out for college bills don't. Hence a good credit score comes in very handy. Also what comes into play is the area you live in. There is a big difference in housing costs if you live in let's say Cedars Rapids Iowa or Boston Mass metro area. Your housing costs for descent family home in Iowa is probably 170 thousand versus was 400 thousand. Putting even half down on a Iowa home would be tough much less a Boston home. Now if you live in some burned out coal town in applachia half down would be possible but for most people you would have to be retired or living in poverty to live there. My arguement is that for the majority of the above people FICO score is everything. It's the key to a home and car purchase. I would say that this is probably a bit flipped. Those who have plenty of money and use cash for everything, probably have terrible FICO scores. I have one friend who has a few Million in bank and pays for everything with cash and takes no loans and his FICO score is not so great. My argument was not so much that you have to put down 50%, but the more you rely on cash and keep your finances proper, the less your FICO score is important. If you put 20% down and have an average FICO score (around 650 to 680) the difference between your payment and someone who has a 900 is pretty minimal. If you don't carry a balance on your credit card, than the interest rate carried on the credit card is not that big. If you put some money down on a car (like 10%) even with poor credit, you can usually qualify for the 0% Interest or 1.99% Interest. As I said my cash situation is not good but most people I have met with poor credit also have no cash. Dgszweda you are right that cash overcomes weak credit and now understand that was your point. Point well said. Now Im hoping you and money bags Bert will offer an all expense paid Sharper Iron conference in Barbados this winter. We need to discuss theses important matters in person. Bert you and Dgszweda can make a large donation to Sharper Iron get a tax write off and away we go a week at the beach sucking down cold ice teas and shrimp cocktails. I'll be glad to discuss any these important matters and others on the beach. Jim gets the executive suite. I have been to Barbados and recommend the Cunard Lines resort hotel. We can even do a fishing charter for Marlin but only if Bert swears he won't throw me overboard.